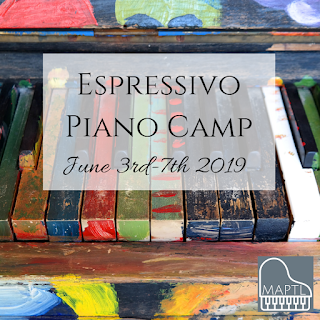 If you're looking for a great way to kick off piano study for the summer, you'll definitely want to check out Espressivo Piano Camp. What is Espressivo Piano Camp, who's it for and what are the benefits? One of my current students asked to learn this song, and I must say this was a fun piece to put together for late beginning piano. 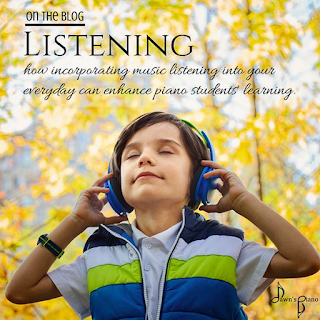 I strongly encourage my students to pursue playing the music they like, because it connects us to our own learning process and demonstrates the value of the skill we are learning. This pop/rock classic offers good practice in syncopation, changing key signatures and dynamic range. 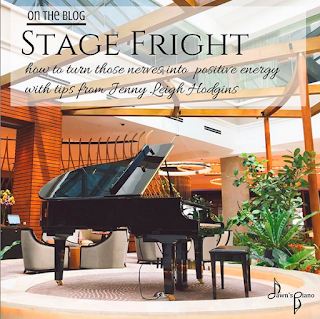 Because the themes are repetitive, it works well as a late beginning piano solo with only a couple rhythms & passages to work out, and then the player's job is just to follow the patterns and repeats, and have fun. 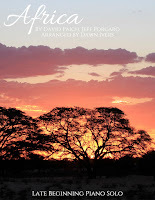 As with all my arrangements of popular pieces, the sheet music is available for purchase on Sheet Music Plus where you can also preview the sheet music. look insideAfrica by Toto - Easy Piano Solo By Toto. Solo Part. 6 pages. 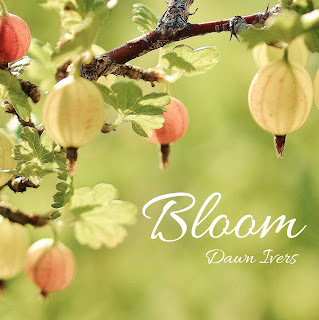 Published by Dawn Ivers (H0.510797-SC000003618). 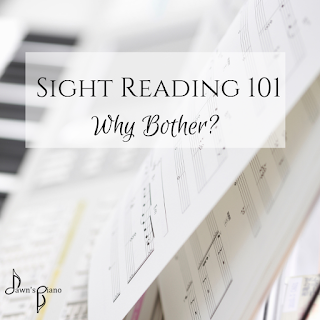 Progress in piano study can be difficult to recognize because it is so gradual. This can sometimes feel discouraging for the student, because even though we make strides from week to week, it's not always easily measurable from the student's perspective. The best way to remedy this is to track and celebrate long term progress. Those who follow the studio on social media will know that I often share student videos. In addition to celebrating current success, these videos can also be a way of marking where we've been so at a later time students can look back and see how far they've come. 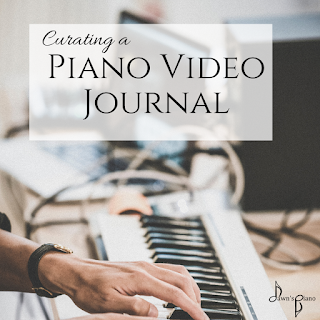 But you can go further than this by keeping a video or audio journal of your child's piano progress. In episode 128 of the Piano Parent Podcast Shelly gives us some tips on how to keep just such a video or audio journal of a piano student's musical journey. 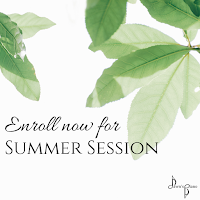 Enrollment for the Summer Session at Dawn's Piano is officially open! For new beginning students, Summer is a terrific time to try out piano lessons and see if they are a good fit for you before committing to the coming school year. For existing students, or those who have a little musical experience, summer is when we get to stretch our creativity with a Young Composers project. What this means is each student who participates will work on composing an original piece of music, notating it, and recording it. At the end of the summer we will publish an e-book & album of all the collected compositions. 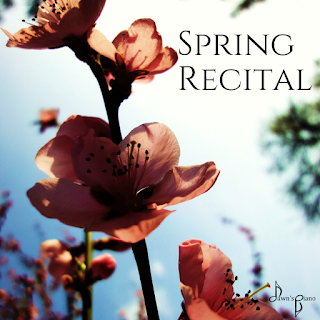 Because tuition at Dawn's Piano is always all-inclusive, this program is no extra cost to you! Check out one of the past Young Composers projects here. My final practice trick for you this month is visualization. If you've played sports or done other competitive activities, you may have heard of this before as a training technic. And it does work in practicing your instrument as well. If you follow the blog regularly, you may have caught my book review of This is Your Brain on Music by Daniel Levitin last month. In reading it I learned that when we imagine doing something, the same portions of our brains fire up as though we were actually doing it. This is why visualization actually can work. When I am using visualization to practice a piece of music, I like to have the sheet music in front of me and I read along at the performance tempo, and mentally 'play' the piece. I know which fingers fall on each note, I hear the piece in my head, I know which parts get louder or softer. I rehearse all the elements minus actually playing it on a piano. Backing tracks are my favorite new practice tool! I'd been using them a little bit for the past couple years, but after moving & transitioning to lots of online lessons where playing in-person duets is not as feasible anymore, backing tracks have taken center stage. And after implementing them so successfully with online students, I've also started using them more with my in-studio students too! So what is a backing track? 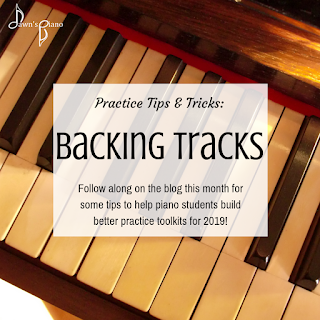 A backing track is a recorded accompaniment that your piano student plays their piece along with. It can either be a piano duet part or a full band accompaniment. If there are backing tracks for your music, I will bring them to your attention so you can arrange to have access to them at home.